Begin by traveling South on I-81 South towards Roanoke. Continue to follow I-81 South. Merge onto Richmond Avenue/US-250 West exit 222 toward Staunton Travel for 2 miles and Consumers Auto Warehouse is located at 537 Richmond Ave, Staunton, VA 24401. Begin by traveling North on I-81 North toward Lexington. Continue to follow I-81 North. Merge onto US-250 West exit 222 toward Staunton/Mary Baldwin College. Travel for approximately 2 miles and Consumers Auto Warehouse is located at 537 Richmond Ave, Staunton, VA 24401. Begin by traveling West on I-64 west. Continue to follow I-64 west. Merge onto I-81 North exit 87 toward Staunton/Winchester. Travel for 1 mile and merge onto Us-250 West exit 222 toward Staunton/Mary Baldwin College. 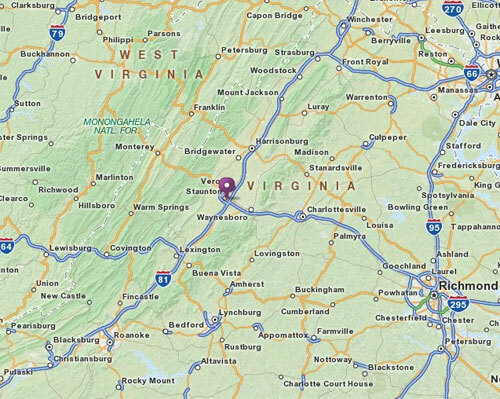 Travel for approximately 2 miles and Consumers Auto Warehouse is located at 537 Richmond Ave, Staunton, VA 24401. Begin by traveling East on I-64 East toward Clifton Forge/Lexington. Continue to follow I-64 East. Take the I-81 North exit toward Winchester. Travel for 1 mile and merge onto US-250 West exit 222 toward Staunton/Mary Baldwin College. 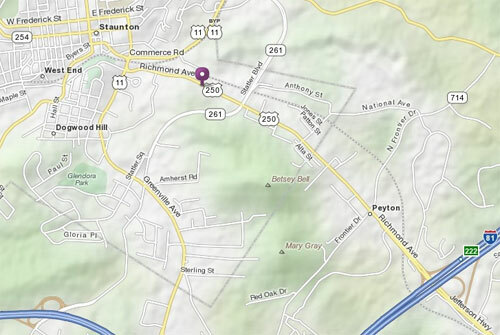 Travel for approximately 2 miles and Consumers Auto Warehouse is located at 537 Richmond Ave, Staunton, VA 24401.